The earliest area settlers were Andrew "Andy" Bragg and Nelson Sneed, black farmers who moved here in 1870. Former slaves, they were later joined by other freedman farmers, landowners and tradesmen. The settlement that resulted was known as Andy. In 1916 former Palestine banker H.L. Price moved to the community. Encouraged by the area's potential as a commercial and agricultural center for blacks, he directed formation of the Andy Real Estate Company. He was joined in the operation by his son Cuney Price, W.D. Thomas, J.Z. Thomas, W.A. Hall, and John Bragg. 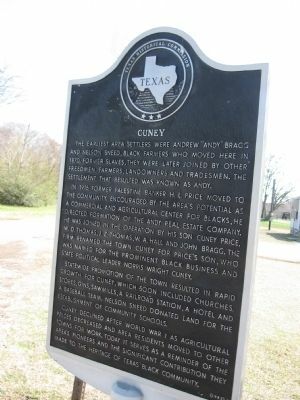 The firm renamed the town Cuney for Price's son, who was named for the prominent black business and state political leader Norris Wright Cuney. Statewide promotion of the town resulted in rapid growth for Cuney, which soon included churches, stores, gins, sawmills, a railroad station, a hotel and a baseball team. Nelson Sneed donated land for the establishment of community schools. contribution they made to the heritage of Texas' black community. Location. 32° 1.866′ N, 95° 24.993′ W. Marker is in Cuney, Texas, in Cherokee County. Marker is at the intersection of U.S. 175 and Farm to Market Road 3327, on the left when traveling west on U.S. 175. Touch for map. Located near Post Office. 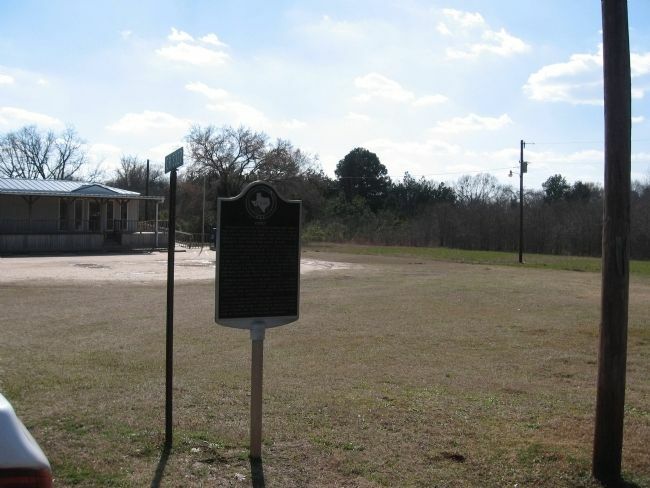 Marker is in this post office area: Cuney TX 75759, United States of America. Touch for directions. Other nearby markers. At least 8 other markers are within 9 miles of this marker, measured as the crow flies. Site of the Kickapoo Battlefield (approx. 4.3 miles away); Frankston Railroad Depot (approx. 5.4 miles away); Old Neches Saline Road (approx. 6.6 miles away); Earle's Chapel Methodist Church (approx. 7.6 miles away); Earle's Chapel Cemetery (approx. 7.6 miles away); Love's Lookout (approx. 8.1 miles away); Dewberry Plantation House (approx. 8.9 miles away); Camp of the Army of the Republic of Texas (approx. 8.9 miles away). More. Search the internet for Cuney. Credits. This page was last revised on June 16, 2016. This page originally submitted on March 4, 2010, by Steve Gustafson of Lufkin, Texas. This page has been viewed 997 times since then and 13 times this year. Photos: 1, 2. submitted on March 4, 2010, by Steve Gustafson of Lufkin, Texas. • Bill Pfingsten was the editor who published this page.